Fuelled by feedback and demand from the Australian market, Isuzu UTE have refined the D-MAX and MU-X range for 2018. 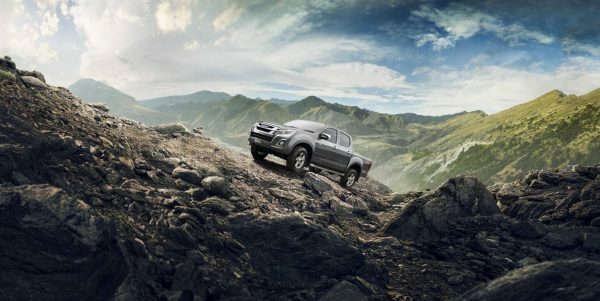 The 18MY Isuzu UTE range, bolstered by a number of upgrades, refinements and safety inclusions, is in a prime position to continue its growth within the two most highly-competitive segments of the market — the 1-Tonne Ute and Large SUV segments. In particular the D-MAX has been growing in popularity thanks to its durability, reliability, towing and serious off- road ability. The latest enhancements have looked to bolster this ‘fit for purpose’ position specifically for Australian conditions, while some key refinements to ride and interior look to cater for the demand for more car-like comfort. Essentially, the 18MY models will look to increase our current customer satisfaction as well as attract a wider audience. Long established as a marque for the workman, for 2018 Isuzu UTE has refined the flagship ute offering — expanding the D-MAX range to officially include an upgraded D-MAX LS-T Crew Cab, boasting premium features previously not part of the Isuzu UTE range. Positioned at the driver seeking the perfect balance between ‘tough and rugged’ utilitarian and passenger friendly versatility and refinement, the 18MY Isuzu D-MAX LS-T is positioned to be on the shortlist of buyers considering a premium 1-tonne ute. Straight off the back of a plethora of major-upgrades in 2017, the 18MY D-MAX range is now headlined by the flagship LS-T, featuring many of the standout features and amenities as found on the MU-X LS-T; 18” wheels with Highway-Terrain (HT) tyres, Sat Nav, roof rails and a Passive Entry and Start System (PESS) on 4×4 LS-T only. Just like the rest of the range the 18MY D-MAX LS-T is powered by Isuzu’s exclusive 3-litre turbo diesel 4JJ1-TC engine — generating 130kW and 430Nm — paired with the smooth Aisin-built AWR6B45 6-Speed Automatic Transmission. 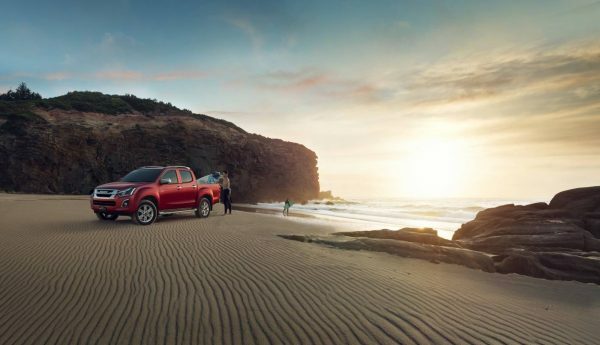 Respecting that not all owners necessarily take their ute off-road — instead preferring a ute for the unmatched family-friendly space and versatility, the flagship LS-T is available in two drivetrains; two-wheel drive or through Isuzu’s “Terrain Command” 4WD Select System. Borrowing styling cues from the flagship MU-X LS-T, the 18MY D-MAX LS-T has been tastefully refined with the additions of a new premium leather accented interior, featuring rich genuine perforated leather (on body contact areas) which is proven to breathe better than non-perforated — plus additional accents of polyurethane leatherette on the hard wearing bolsters and rests. The dash, glovebox and armrest are trimmed in soft touch leatherette, door handles finished in chrome and the air vents and window switches finished in gloss black for a premium look — these soft-touch refinements can also be found inside the D-MAX LS-M and LS-U variants. Another interior update for the D-MAX 18MY LS-M, LS-U and LS-T variants is the addition of two 2.1-Amp USB charge points; one in the dash, and one in the rear console. This update is fuelled by customer feedback on charging personal mobile devices whilst on the road, and can also be found across the entire MU-X range. With more and more families turning towards utes for their daily drive, Isuzu engineers have developed a new 3-span leaf spring setup for SX, LS-U and LS-T Crew Cab ute variants — a suspension tune developed with Australian customer feedback in mind. Through the use of stronger and lighter materials this new setup not only improves the ride, comfort and handling — the setup has proven to not compromise the payload capacity versus the 17MY 5 leaf spring setup. Along with the 18MY suspension upgrade for Crew Cab ute variants, Isuzu Engineers have reassessed the Gross Vehicle Mass (GVM) capacity of the entire 18MY D-MAX range — increasing the GVM on 4×2 models to 2,950kg and the GVM on 4×4 models to 3,050kg. This improvement increases the payload capacity of all models by 100kg in comparison to 17MY models. This upgrade gives the D-MAX 4×2 low-ride SX Single Cab Chassis class-leading payload capacity of 1,349kg. 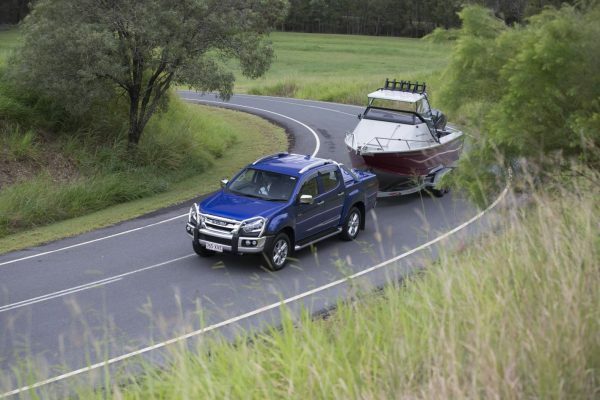 According to feedback from owners, half on average purchase an Isuzu for the purpose of towing — highlighting the strength and versatility of the D-MAX and MU-X powertrain. With that in mind, Isuzu engineers have added Trailer Sway Control (TSC) across all 18MY models (excluding the D-MAX 4×2 low-ride SX Single Cab Chassis manual), improving on the active safety system offerings. Stemming from the vehicle’s Electronic Stability Control (ESC) system, the TSC system monitors trailer movement through the ESC sensors and modulates throttle and brake inputs to individual wheels — bringing the towed trailer under control if unsolicited sway is detected. Safety has always been at the forefront of Isuzu vehicle development. Previously reserved for LS variants, all 18MY D-MAX ute models now feature a rear bumper to improve occupant collision protection, along with a reversing camera as standard for increased safety and visibility — however both remain optional on cab chassis models due to the nature of the tray. 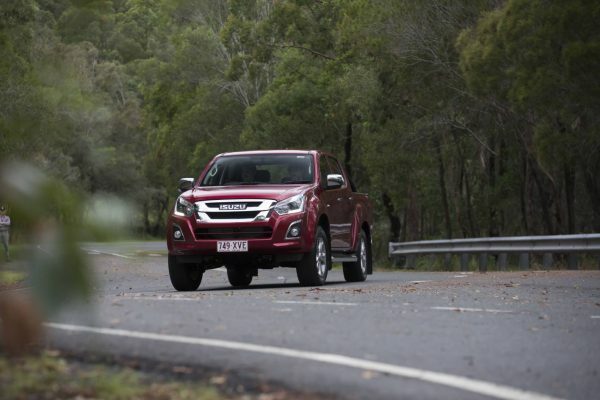 As a testament to the immense confidence we have in building durable, reliable and efficient vehicles, every Isuzu vehicle is backed by the Isuzu UTE Australia Service Plus Program which includes a 5 year warranty, 5 years Roadside Assistance and 5 year/75,000 kilometre Capped Price Servicing program – which adds further peace of mind when it comes to protecting your investment and your wallet. Through continual refinement of our Isuzu D-MAX and MU-X, Isuzu engineers have structured a highly competitive Capped Price Servicing Program for 18MY – onwards vehicles, featuring a 12 month or 15,000 kilometre interval. In fact, over the course of 60 months the cost of ownership is one of the most economical within the 1-tonne ute and ute-based SUV class. Driven directly from feedback, Isuzu UTE has refined the 18MY range with bold new colours across the D-MAX and MU-X range. The 18MY D-MAX range is headlined with the addition of a three new colours; Magnetic Red Mica, Cobalt Blue Mica and Graphite Grey Metallic. The 18MY MU-X is also now available in the new Magnetic Red Mica. The 18MY Isuzu D-MAX and MU-X range will go on sale nationally from the 1st of May.